Finally a food post that is NOT about breakfast. I made this curry earlier this week for Benzo and I and FIL who was over in the evening helping out with some stuff around the house. I just cooked up a batch of dried chickpeas on Sunday using the crockpot method, so it made sense to have a chickpea recipe for dinner this week. This curry is very similar to another chickpea curry I made, but I swapped cauliflower for potatoes and used diced tomatoes instead of tomato soup. The other recipe called for condensed tomato soup and I’m not too hip on using condensed soup as it has a lot of crap in the ingredients. So I decided to used plain diced tomatoes instead. I also used cauliflower instead of potatoes because I didn’t have any potatoes on hand. Heat oil in skillet. Cook onion until soft. Add garlic and cook for a minute or so. Stir in all spices and cook for another minute or so. Add in tomatoes, chickpeas, cauliflower and coconut milk. Simmer until cauliflower is tender, about 20 minutes. Note: I added 1/2 cup of water while cooking because it seemed a little dry. After I did this I realized it was a mistake. The frozen cauliflower gave off some water once it warmed up so the curry ended up a little too watery. I just simmered it longer until it cooked down and then used a slotted spoon to serve. It ended up being fine in the end. So if you feel like you need to add water, do so in a smaller amount first or wait until the frozen veggies are cooked a bit and then make the decision. I served the curry over brown rice using this fool proof method for cooking brown rice. Seriously you must bookmark this page or just memorize it because it’s so easy. I’ve never had a batch of brown rice not turn out perfect with this method. I also have it linked on the Basics tab. For this meal I used 2 cups dry brown rice to 3 cups water. I also pulled two pita pockets out of the freezer and cut them into fourths. But they had apparently been in a freezer a little too long as they were quite tough and chewy. Naan would’ve been much better! But they served their purpose of being a “scooper” for the curry and rice. This meal served all three of us for dinner, including seconds for Benzo and FIL. And then there was enough for leftovers for both Benzo and I for lunch the next day. Honestly I just love making curry like this because you get protein, vegetables and whole grains all in one. It really feels like a complete meal to me and I don’t have to worry about side dishes or anything like that. Plus is makes a lot and I love leftovers. Question – do you like leftovers? I love them for lunch the next day. But I knew a girl in college who hated leftovers. She wouldn’t eat them. If she had leftover food she would throw it out. Gasp! 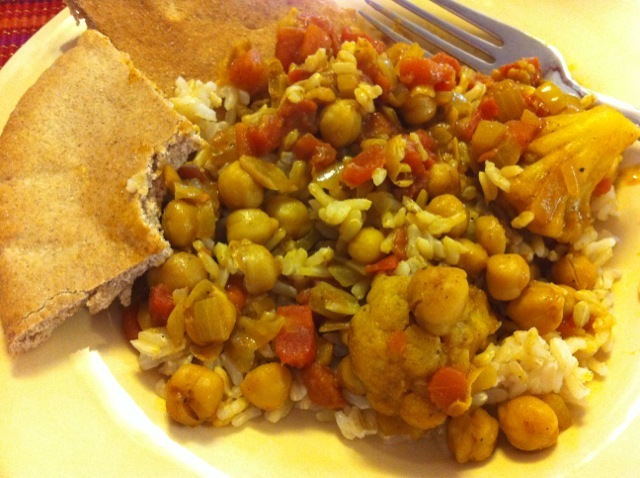 I love cauliflower and chickpeas and curry so this is a hit. I’m bookmarking this for a future meal.